Bob and I had made several attempts to photograph Wood Ducks (Aix sponsa) at High Park over the past year, but it wasn’t until one sunny morning early this spring that we actually succeeded in finding a pair of them in favourable light conditions that helped to show off their stunning plumage. 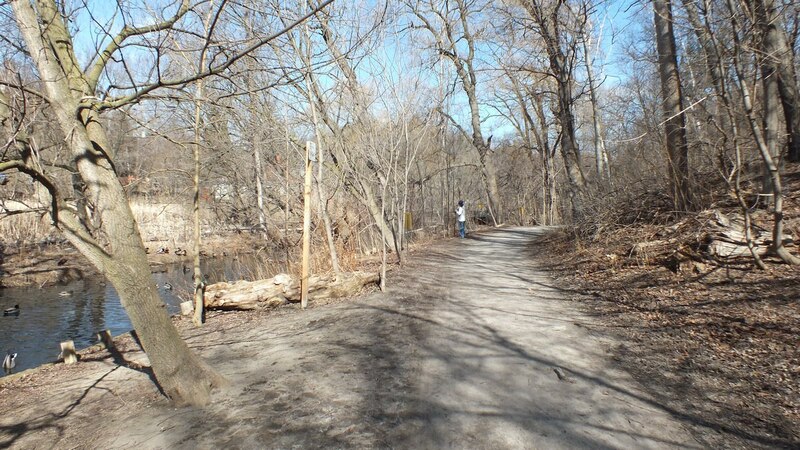 High Park is a mixed-use municipal park that covers a large area in Toronto, 161 hectares. A large section of the Park remains as natural forest, ravines, savannah, lakeshore habitat and accompanying marshland. For that reason, it is a good destination for birdwatchers who will find an assortment of waterfowl, birds of prey and songbirds to observe and photograph. The day we visited the Park, Grenadier Pond remained totally frozen over, but we could see open water where the creek enters the pond from the north. Bob and I walked to the end of the trail alongside Wendigo Creek since a lot of ducks usually congregate below the bridge there. That is where we found the first male Wood Duck of the day, flanked by dozens of Mallard Ducks. As luck has it, that male Wood Duck disappeared into the marsh beyond a screen of weathered bulrushes. I stood there disappointed and got only glimpses of it perched on a log with the bleached reeds rustling in the foreground. 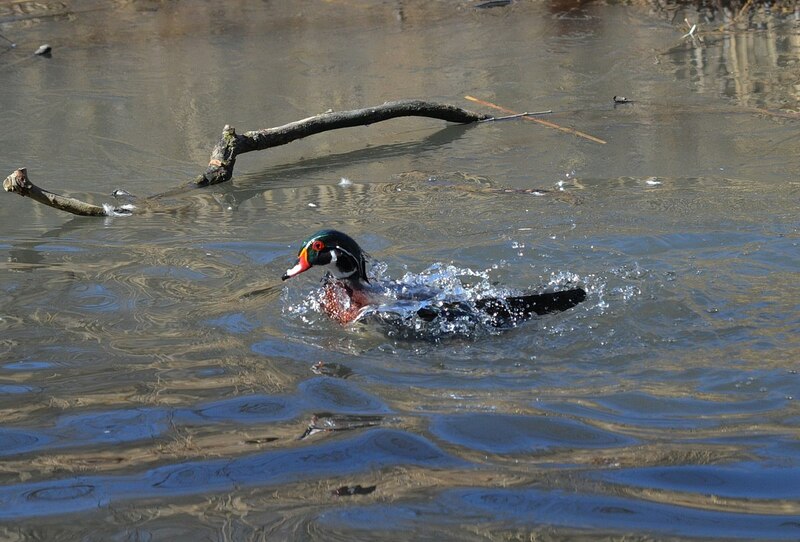 Within minutes, Bob spotted another Wood Duck downstream from there. Every other time we came across Wood Ducks, they were either in the distance on a large body of water or in the shadows. I was over the moon with happiness at the sight of this Wood Duck so nicely illuminated by the spring sunshine and within feet of where I stood on the trail. 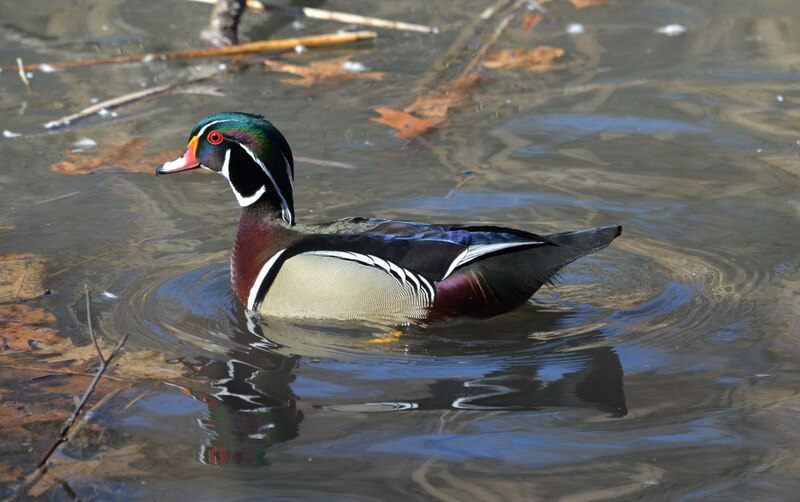 Male Wood Ducks in breeding plumage are considered by many to be the most stunningly beautiful of all waterfowl in North America, perhaps even in the world. The male wears his multi-coloured breeding plumage from October through to June. It is only in late summer that a male Wood Duck has a brief moult, and at that time, he will appear similar to the female Wood Duck except for his red eyes, white lines defining the cheeks and colourful bill. 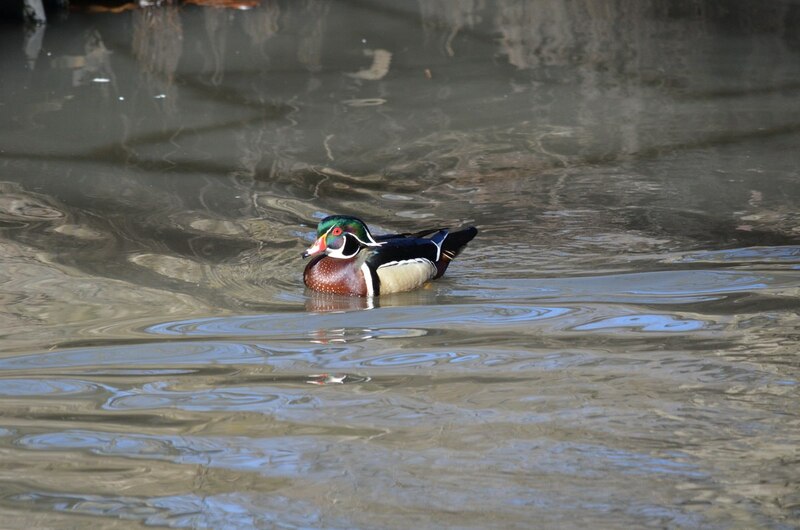 One aspect of a male Wood Duck’s appearance that is diagnostic is the shape of its head. Held high on a thin neck, the boxy, crested head is unique among ducks. 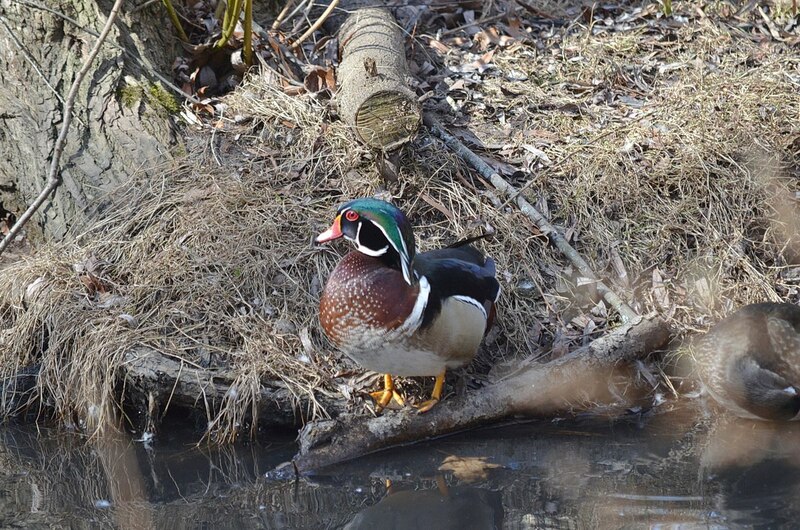 This showy male comported himself proudly, and to our pleasure, we were able to discern all of the subtle shading that makes a Wood Duck’s plumage so impressive. Bob and I were delighted when the drake climbed out of the water onto a log because the feathers on the neck and breast were shown to great advantage. Their purplish hue is accentuated by white triangular spots that fade into a white lower breast and belly. The golden flanks are bordered by a pair of wide black and white streaks in front and delicate white and black curved bands above. What intrigued me most was the long, shaggy crest made irresistibly attractive by the phenomenal green, blue and purple sheen of the feathers as they trailed down onto the bird’s back. And although the back is mostly black, again the blue and green iridescence transforms the delicate plumage into a work of art. 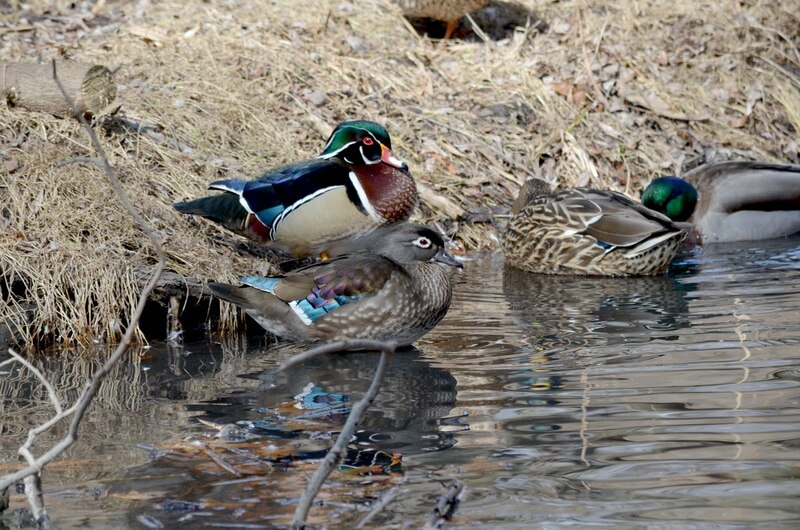 We were not about to ignore the female Wood Duck that soon showed up at the drake’s side. She, too, has a downward sloping crest at the back of the head, although it is not nearly as noticeable. A pretty green and purple gloss transforms the dark grey head into a thing of beauty. With the subtle tones of her olive-brown and grey plumage, the hen is distinctly elegant, made all the more so by the lovely teardrop-shaped white eyering. 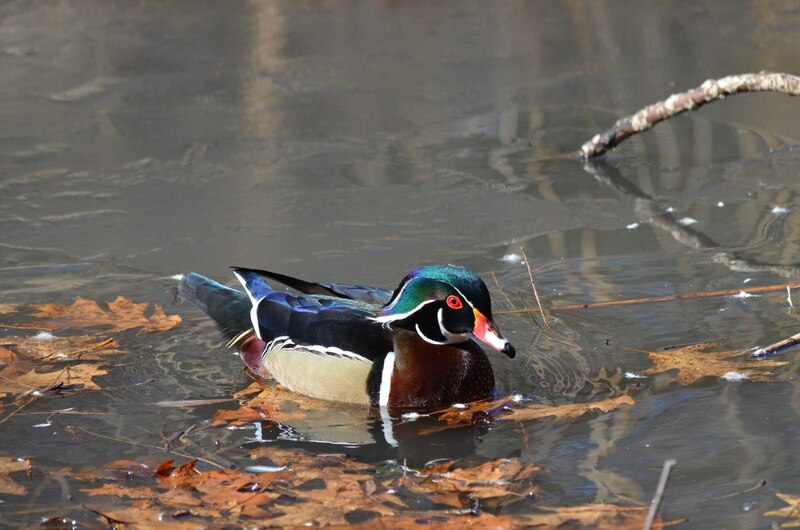 Like the male Wood Duck outshines all other male ducks, the female is also regarded as a standout when it comes to females of other duck species. Her subdued greyish-brown plumage is changed dramatically when the sun’s rays reveal a startling purple, green, blue and bronze sheen. There is no denying the hen’s impressive colouring. Bob and I delighted in following the Wood Ducks’ antics as they cruised up and down the modest section of open water, one never far from the others side. 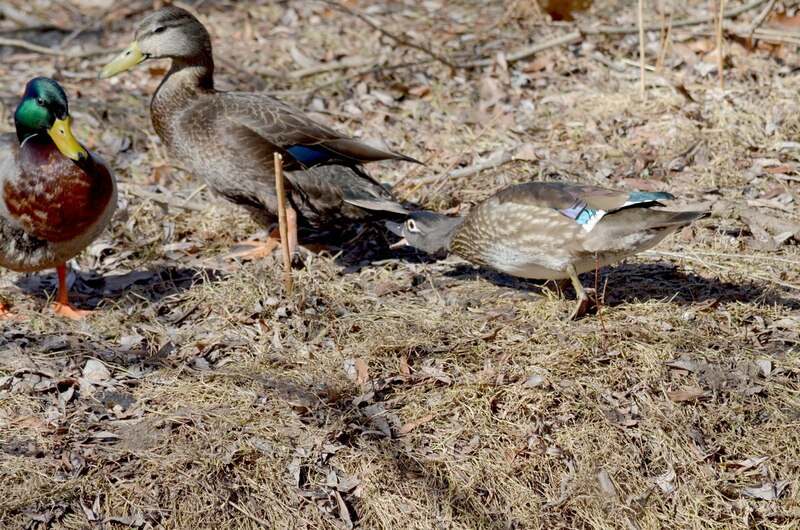 Like most Wood Ducks, these two probably paired up before migrating north from their wintering grounds in the southern United States. 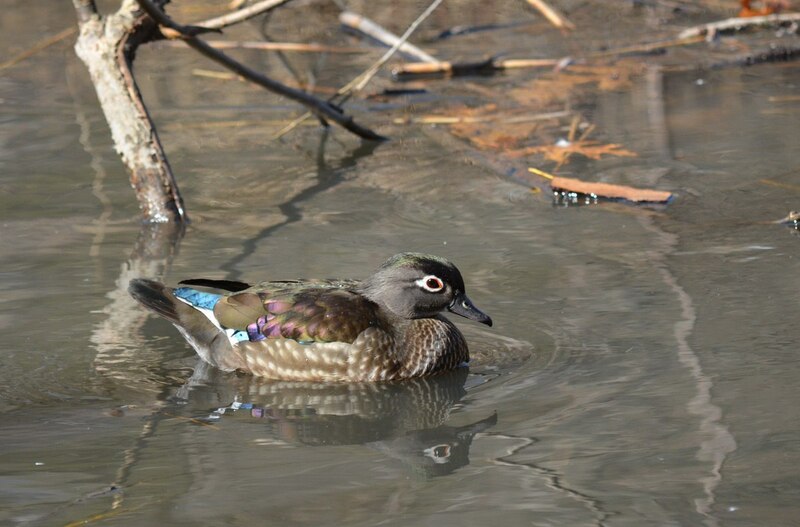 In some cases, pairs may form during spring migration, so by the time Wood Ducks arrive at their Canadian breeding grounds, they are ready to start breeding. 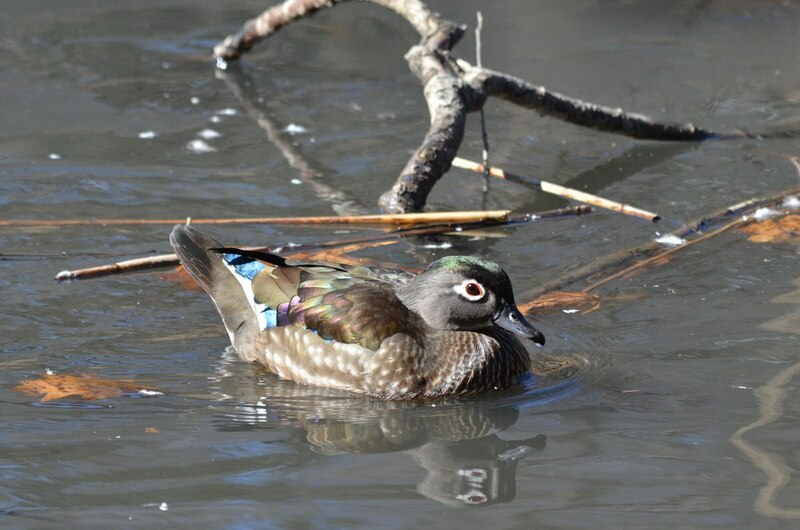 Breeding season for Wood Ducks varies throughout their range with populations here in the norther part of their range starting even as early as March and on into April. The swamp adjacent to Wendigo Creek provides the perfect habitat for both nesting and brooding, with the creek and Grenadier Pond providing the necessary feeding areas. There is a good chance that this female Wood Duck was a hatchling on the pond in High Park because females of this species often return to the place where they began life to raise their own brood. 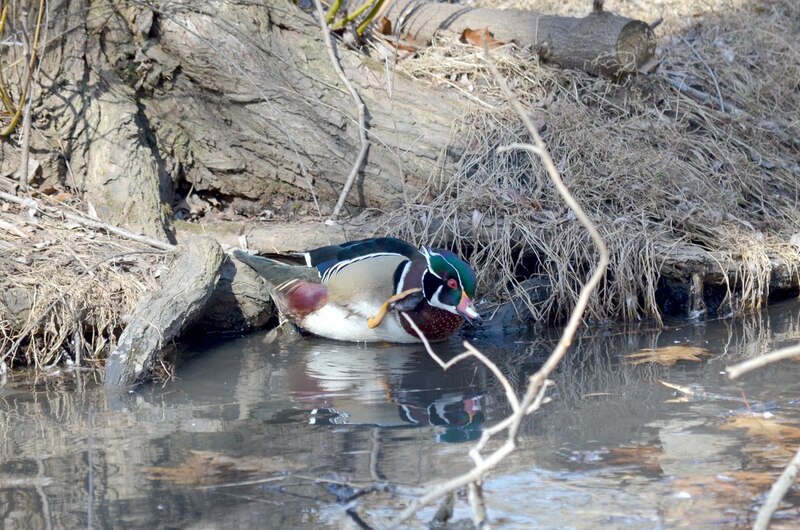 This hen certainly took great pleasure in the available open water of the creek given that most other bodies of water in the area were still frozen solid. As she went about her ablutions, I couldn’t get over how the water rolling off the duck’s back looked like molten glass, frozen in time. Whether this pair were mated or not, for we could not be sure, the female certainly put on quite a show. 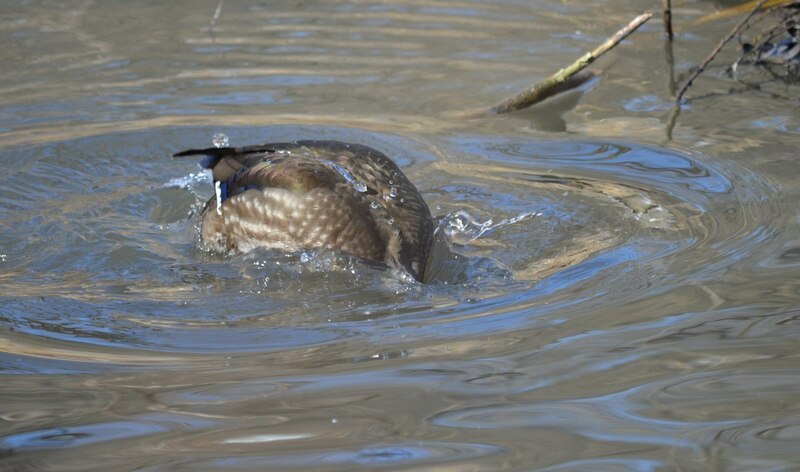 As if to turn a blind eye, the drake focused his attentions at the far end of the open water where it disappeared under the ice. As the Wood Duck bobbed along, buoyed by a quicksilver mirror, Bob and I had nothing but appreciation for the drake’s ornately marked face. 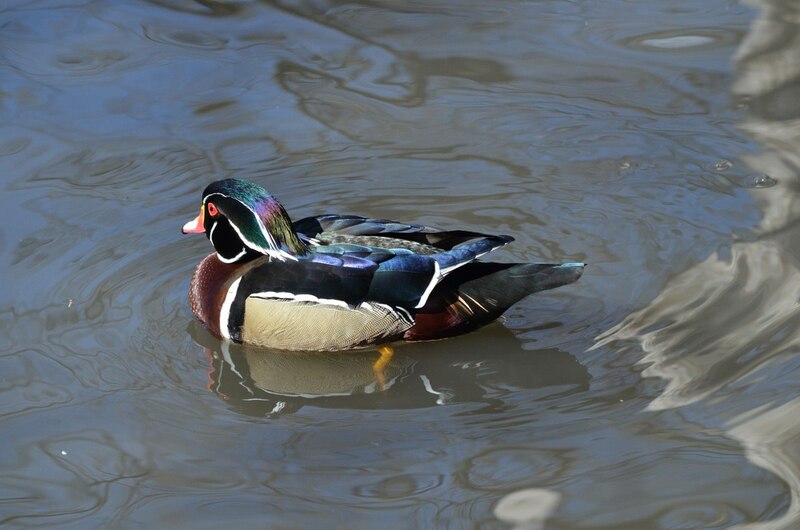 In fact, a male Wood Duck in breeding plumage displays elaborate patterns on almost every feather, and boasts over six different colours on its body. The face, itself, is further enhanced by the bright red eyes, sharp white lines and unusual reddish beak. 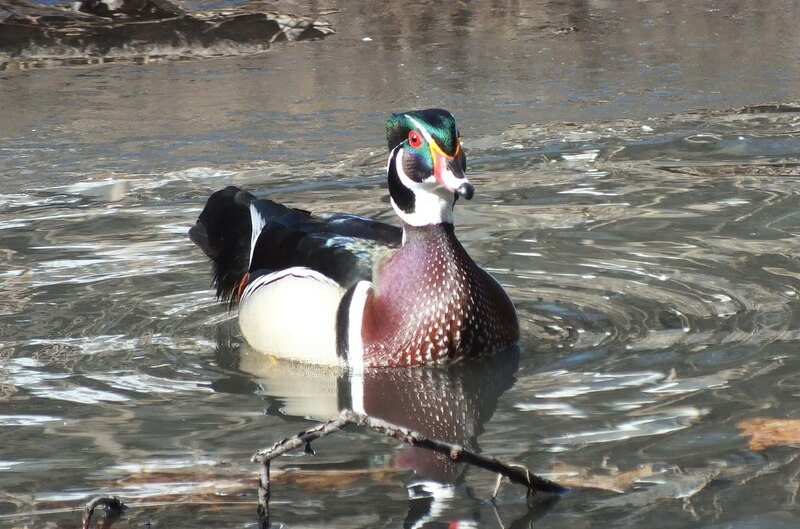 and readied to strut his stuff for the female Wood Duck that appeared to be his mate. 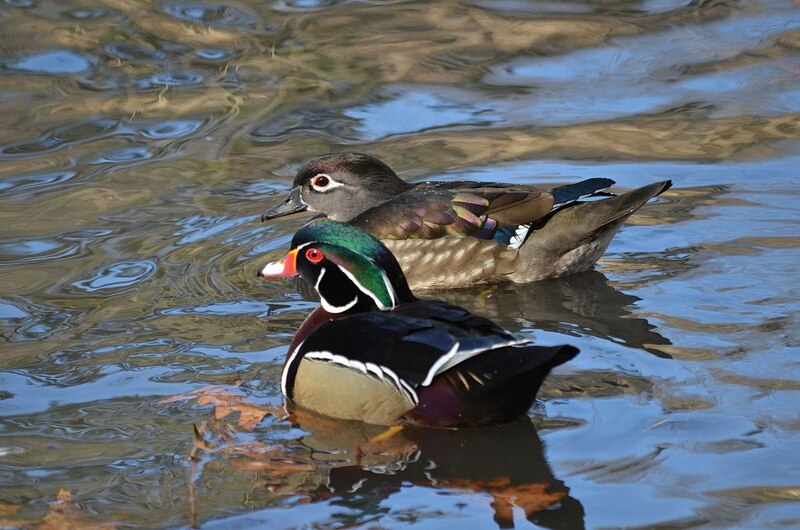 This pair will have to get busy if they hope to raise the two broods that are customary for Wood Ducks in one season. 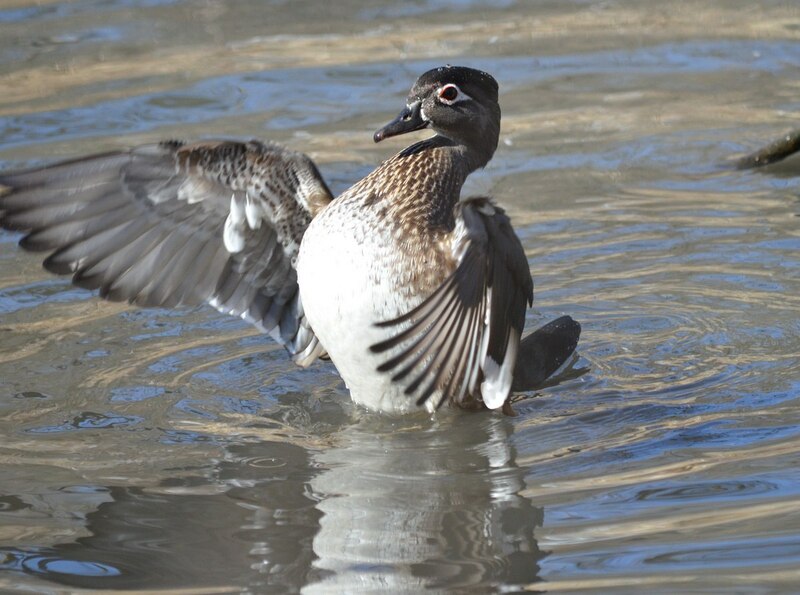 This species of duck, unlike most waterfowl, uses a hole in a tree for its nesting location. A natural cavity will be used or oft times a hollowed-out cavity left behind by a pileated woodpecker. 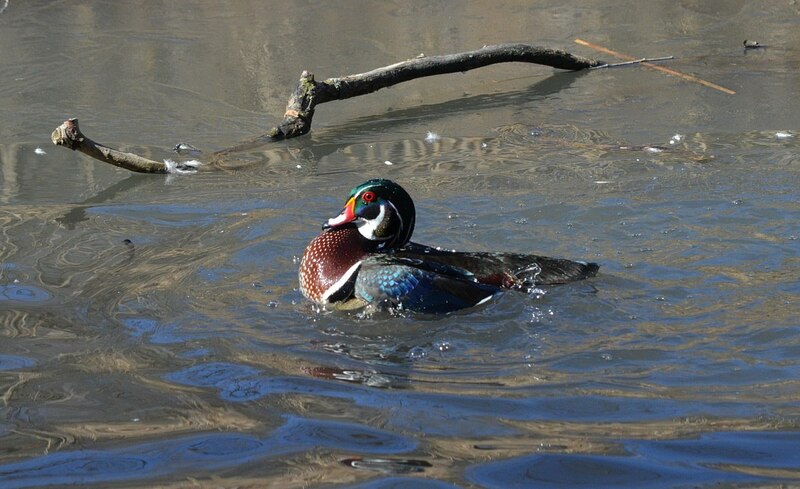 This is why Wood Ducks seek out wooded areas near standing or slow-moving freshwater for their summer habitat. 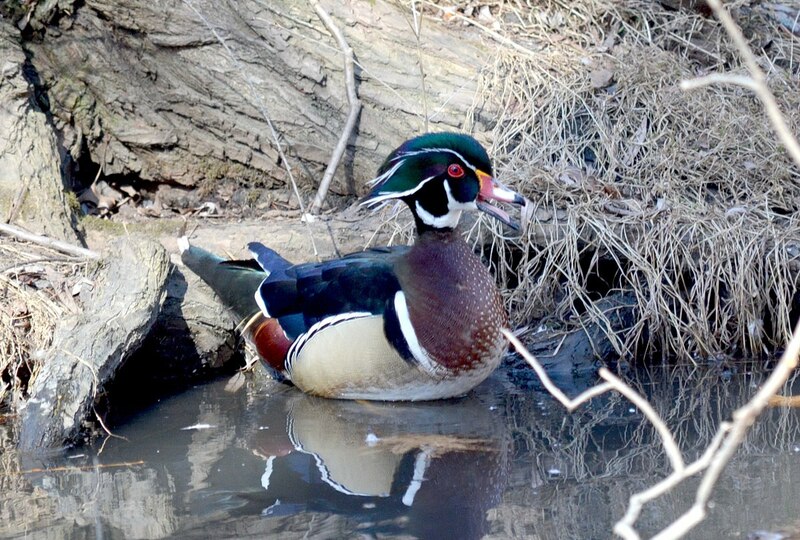 Wood Ducks are well prepared for nesting in tree cavities because they have strong claws that facilitate perching on tree branches and gripping bark. Only a few other duck species share this trait. Wood Ducks are also adept at flying through the forest canopy with a well-suited broad tail, short, broad wings, and excellent vision. Young hatchlings are able to climb out of a deep nesting cavity using their claws for purchase. 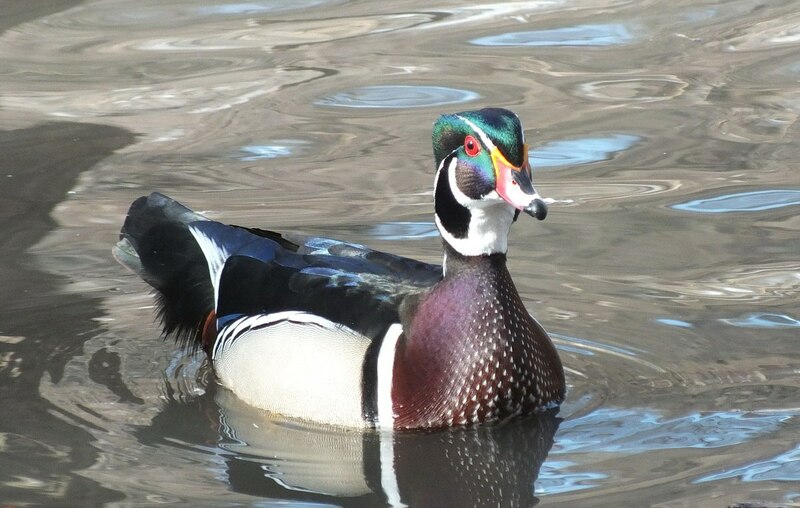 At one time, Wood Ducks were classified as dabbling ducks, but their unique physical and behavioural differences led ornithologists to reclassify this species as perching ducks. 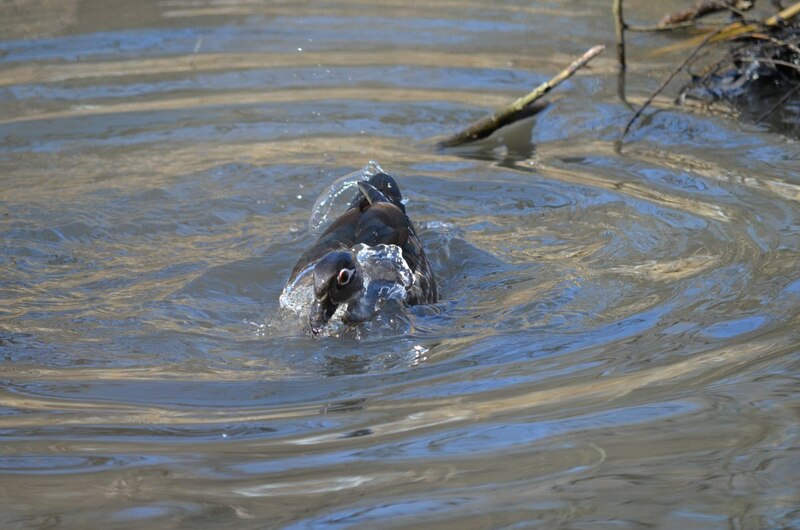 Although they do feed by dabbling or upending, they also make forays onto dry land. On the forest floor, they forage for a wide variety of plant materials such as berries, acorns and other seeds and nuts, giving rise to one of their alternate names, Acorn Duck. This hen had no intention of foraging when she climbed onto the riverbank. Instead, she was giving attitude to one of the Mallard hens. 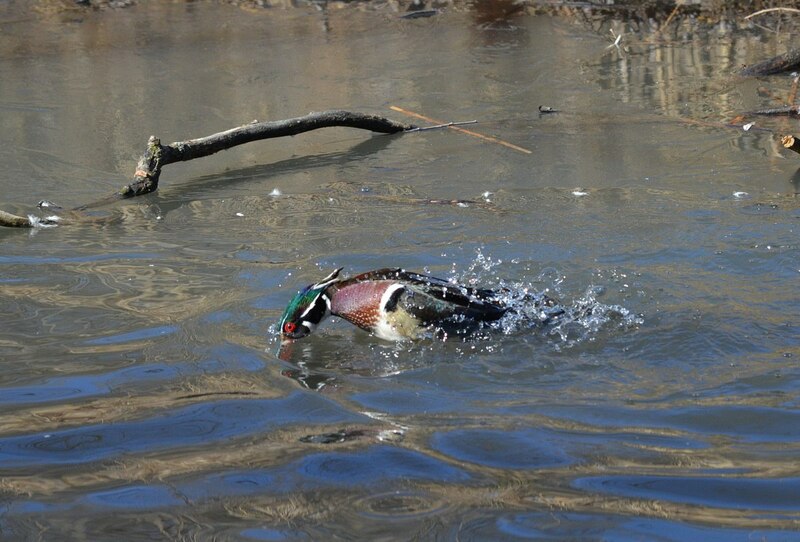 Wood Ducks are omnivores with vegetable matter making up at least 80% of their diet, and a good share of that is procured from the body of water where they make their home. Pondweeds, duckweed, water lilies, and water primrose are a few of the plants important to their diet, with insects, caterpillars, snails and other invertebrates adding necessary protein. 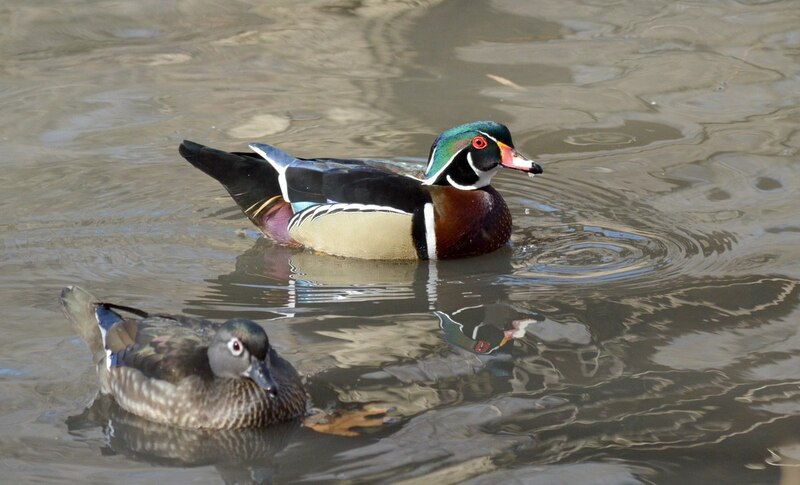 Bob and I spent hours observing this pair of Wood Ducks and were in awe of the multi-coloured plumage that is so regal. This species is widespread across North America, but only the northern populations migrate south for the winter. 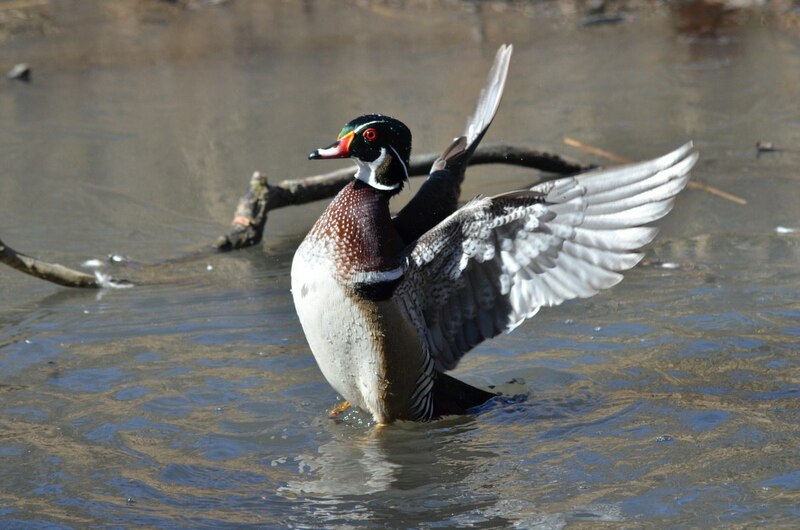 In the southern parts of their range, Wood Ducks are year round inhabitants. Bob and I left the pair of Wood Ducks sunning themselves at the side of the creek, but I’m sure other admirers were not far behind. We will make a return trip to High Park in a few weeks to see if there is any sign of new hatchlings. They will be adorable.